Mitt Romney, a former enemy-turned-friend of President-elect Donald Trump, responded to the announcement that he won’t be named secretary of state. On Monday night, he said it was “an honor” to be in the discussion for the coveted position, which went to Exxon Mobil CEO Rex Tillerson. “My discussions with President-elect Trump have been both enjoyable and enlightening. I have very high hopes that the new administration will lead the nation to greater strength, prosperity and peace,” he added. During the election season, the former Massachusetts governor and Republican presidential candidate harshly criticized Trump, calling him a “con man” and “a fake.” Trump responded, saying that Romney essentially “choked” against President Obama during the 2012 election. But after Trump was elected, Romney met several times—including holding one meeting in New Jersey. Reports then indicated that Trump was considering naming him as secretary of state, which drew backlash from members of Trump’s transition team, including former campaign manager Kellyanne Conway, who blasted Romney in late November. “We don’t even know if Mitt Romney voted for Donald Trump,” she told reporters at the time. 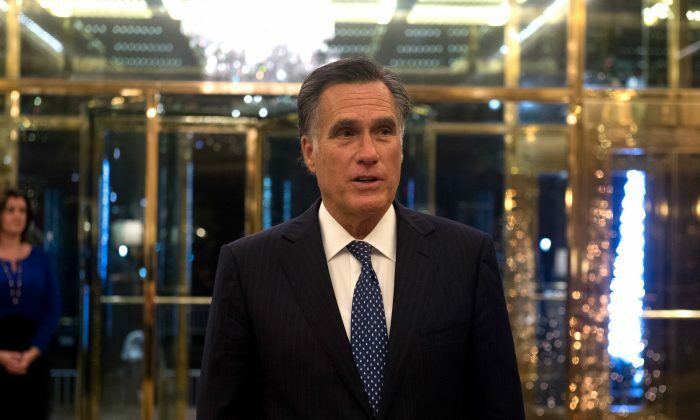 “Receiving deluge of social media & private comms re: Romney Some Trump loyalists warn against Romney as sec of state,” Conway also wrote on Twitter. Former Speaker Newt Gingrich also publicly weighed against choosing Romney for secretary of state. Romney never publicly endorsed Trump for president. In 2012, Trump endorsed Romney, shaking his hand at a conference in Las Vegas.